What a night that was. Halfway through the Oscars, someone decides to leak Demi Lovato‘s new single on the world-wide web. How fun! 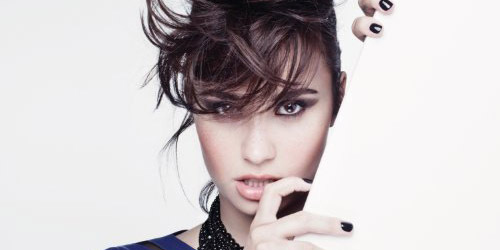 The first single from Lovato’s upcoming album, due out this spring, is called “Heart Attack”. It was originally supposed to premiere on Ryan Seacrest’s radio show this Friday, but due to the leak of the song last night, its web premiere on that site was moved up to midnight (though it suffered due to a traffic overload, I’m betting you were stuck in it) and it went to iTunes very early this morning. (There’s a link for it below in big letters, you can’t miss it.) It’s currently top 30 on the digital retailer as I’m writing this post. This shouldn’t interfere too much with her label’s strategy for this new release, but I imagine it was a bit of a surprise from them that it got out this early. Lovato began revealing lyrics on her Facebook page several days ago and she couldn’t even get through the chorus before someone taped a recording off a computer and just put it out for the world to hear. Oh well. At least the song’s good. Also, let’s clear it up right now, this is not a hot Olivia Newton-John remake. Could you even imagine if that happened? With an electro-pop beat and lyrics with a bit more of an edge, there’s a noticeable difference between it and the singles released from her last album, Unbroken. It sort of reminds me of Jordin Sparks‘s “Battlefield” in parts of the lyrics, but it looks like Ryan Tedder didn’t take part in this. Official credits belong to Lovato, Mitch Allan, Jason Evigan, Sean Douglas, and Nikki Williams. Evigan recently worked with Cher Lloyd on a track for her album, Sticks & Stones. Williams is a singer herself and her debut single in the States, “Glowing”, goes to radio next month. With some emotional-sounding strings and a guitar line lucked straight out of a StarGate single, this is definitely the hit that Lovato needs to keep flying up the charts in no time. The lyrics are accessible enough for her younger audience, especially the “Ken doll”/”basketball” rhyme, while her older audience will enjoy Lovato’s evolution into a little more polished material. BUY “HEART ATTACK” ON ITUNES. Don’t forget, you can follow the blog by clicking the tab below or follow me on Twitter: @AdamFSoybel. Thanks for stopping by!